The fabulous South End Knitters have installed their first exhibit in the Tremont Street windows of the South End library, a show that features a popular urban art form that counterveils the often harsh contours of our public streets’ furniture to give it a more welcoming, exciting and colorful profile. They are part of a legacy of guerilla, graffiti and stealth knitters that can be traced to Magda Sayeg, whose work with the group Knitta Please (founded in Houston in 2005) is credited with bringing sewing from the domestic circle to the street. 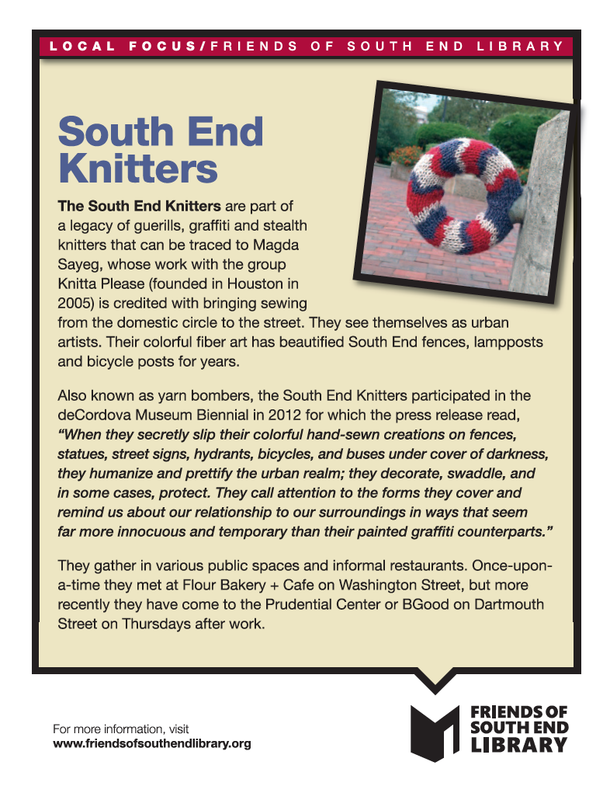 Describing themselves as urban artists, the South End Knitters’ vibrant fiber creations have beautified local fences, lamp and bicycle posts for years. The artful geometric patterns and fiber-teased pom-poms covering the knitted bike frame in the library’s Tremont Street window combine with a quilt-shaped seat and fabric-patched bike lock, paying homage to what was generally considered a domestic form of art now claiming its rightful place in art on display in the public square. 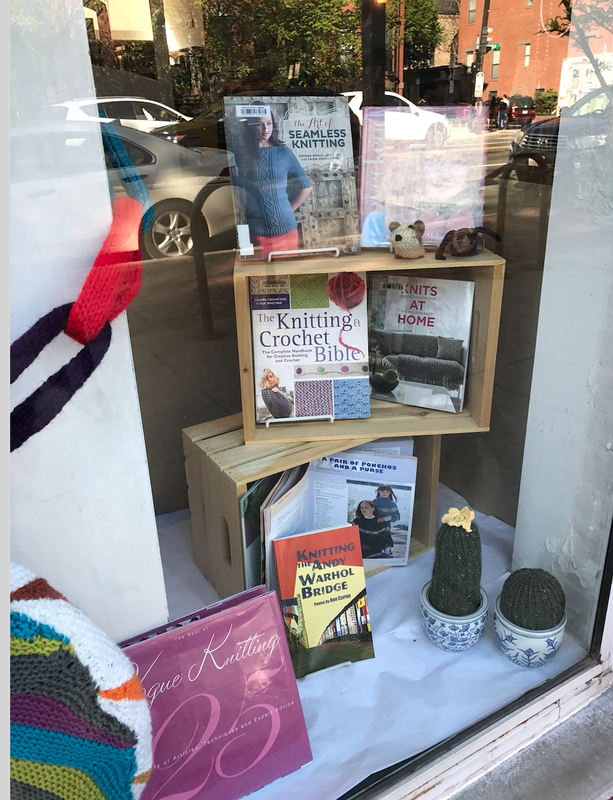 The South End Knitters are a revolving group of fiber artists of all ages, female and male, who gather in various public spaces and informal restaurants to knit, crochet and sew. Once-upon-a-time they met at Flour Bakery + Cafe on Washington Street, but more recently they have come to the Prudential Center across from the Post Office, or b.good on Dartmouth Street on Thursdays after work. This installation will be up for the next few weeks. It is one of a series of Tremont Street window exhibits of the Local/Focus project sponsored by the Friends of the South End Library to visually connect the library community with local artists, non-profits and creative entrepreneurs.